Sitting at the table with my mother and aunt, I begin to discuss the list. Itâ€™s called, â€œYou Know youâ€™re Habesha [Eritrean or Ethiopian] whenâ€¦,â€ I tell them. My father now attentive, to my delight, asks me to read the list out loud. As a first generation Eritrean-American, then 19 years old, I find the stereotypical list of behaviors and actions of my people not only hilarious but more or less true. While my aunt and father find it funny, my mother shakes her head in disagreement and slight offense. This then leads to my attempt to prove that every point is true. â€œYou know youâ€™re Eritrean whenâ€¦ you pronounce the â€œthâ€ with a â€œz.â€ I ask her to say â€œbrotherâ€ and â€œBirthdayâ€ and to my amusement, she continues to say â€œbrozerâ€ and â€œberzeday.â€ I then ask my aunt to say â€œworldâ€ and she pronounces it as â€œworlid,â€ with a rolled â€œr.â€ â€œYou know youâ€™re Eritrean whenâ€¦you say â€œworlid.â€ My dad and I chuckle as we notice the difference. Of course, on any given day, I am quick to correct incorrect pronunciations, an annoying trait my 8- year-old brother has picked up. But my mother is still not convinced by the list. Being the loving daughter that I am, I continue to push and show how wrong she is. 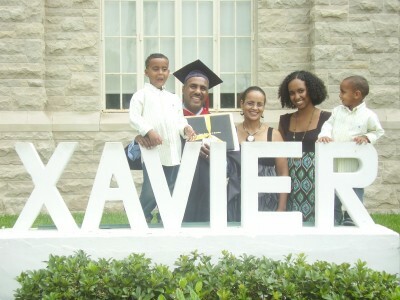 â€œYou know youâ€™re Eritrean or Ethiopian whenâ€¦itâ€™s forbidden to get anything lower than A on your report card, maybe a B, but a C is out of the question.â€ My family wholeheartedly agrees with the statement, but counters that itâ€™s not a cultural stereotype; itâ€™s our familyâ€™s value of education. I am then reminded of how my father managed to get a 4.0 grade point average while working towards his third or fourth Masterâ€™s degree from Xavier University all while working full-time and raising a family. Blame it on family or cultural values or not, the expectation is still there amongst other Eritrean and Ethiopian families and even more generally speaking, other Africans. I try again. â€œYou know youâ€™re Eritreanâ€¦when you have owned or own a Toyota Camry or Corolla.â€ Almost every Eritrean family in Milwaukee has a Toyota, and we are constantly trading in one Toyota Corolla for another. Laughter erupts in our household. Point proven. Going through the list on my own, I immediately stop at â€œYou know youâ€™re Habesha whenâ€¦you think the Harlem shake was stolen from your culture.â€ I distinctly remember a car ride with my uncle as he swore by this statement. The age old tradition of dancing with your shoulders in Eritrean and Ethiopian culture has apparently been popularized by this hip hop ’90s phenomenon. And here I thought my uncle was the only one who thought so. Guess not. Growing up in this household, I have also become subject to the â€œstereotypicalâ€ behaviors of Eritreans, as I make sure to nod in acknowledgment of every Habesha person I see. I talk about my culture so much so that even my closest of friends are able to distinguish Habesha people from a mile away. Although I cannot say if there is a specific marker when identifying my people, as it is just second nature to me, my friends are quick to try. This becomes a game, as they look at â€œtypical featuresâ€ like curly hair, big eyes and skin tone. I even find myself slipping into Tigrinya in daily conversation, teaching my friends simple words here and there. I crave telling people why my last name is my fatherâ€™s first name, sharing that in our patrilineal culture, we are identified by who are father is. Not only do I wholeheartedly identify with the list, and fit its description, I laugh. I am amused that what seems to others as such a unique experience is in fact a collective experience shared by many other Eritrean and Ethiopian Americans. So as my mother shakes her head at this stereotypical list, I laugh in disagreement because I know that about 5,200 people on Facebook completely agree. Check it out.